INTRODUCTION: I remember when I was a little girl this incredible book had come out called Tinker Tailor Soldier Spy by John LeCarre. Everyone talked about it – I saw it first mentioned on the Today Show. I wanted to read it but it looked very dense and hey, it wasn’t science fiction/fantasy so then it wasn’t my flavor of latte. Time went by and I remember being very excited to watch the mini-series on PBS starring Sir Alec Guinness. I really enjoyed it and wished I could see it again. Time went by – hallelujah – and I guess what? I now own the mini-series. I also own the recently made movie by the same name and that is what I will be reviewing today. When it first came out, I missed it in the theater. I’m glad I finally got to purchase it on DVD and watch it, savor it, and totally enjoy it. I feel I have come full circle with this story as now I got to really see it and remember it thanks to the new movie. I even purchased a copy for my Nook. I’m glad I can now immerse myself in this story. It is intelligent, convoluted, and very very good. OVERALL: This movie is perfect. Absolutely perfect in acting, script, and crafting. It is so good. PITFALLS: See Cultural Pitfalls below. FEMALE CHARACTER(S): Although small they are very interesting. Kathy Burke plays Connie Sachs who helps Smiley begin to uncover the truth in the story. She is a fun and interesting character. She has a few strong scenes with Smiley and then we see her in the background in a few other scenes. She is very interesting and one wonders what else there is to Connie. Irina, played by Svetlana Khodchenkova, is a more than a typical women in distress. Although she is in the movie briefly and says very little, there is something going on behind her eyes that gives her an intelligence. She seems to be more than what we see on the film and I like that. Shows she is a person and not just an object or plot device. I also enjoyed watching the office workers who were women in the movie. You got the sense they did their jobs just like the rest of us – even though they were dealing with international secrets – and I find it interesting to watch them as they seem to have a life of their own. Another example of excellent directing: The people in the background look like they have their own lives and stories and that helps make the movie believable. CULTURAL PITFALL(S): It is definitely a time and place piece. It is very much about a certain class of Englishmen in a certain time. If that doesn’t resonate or interest you, you may not like the movie. 1.) Gary Oldman as George Smiley. I am used to seeing Oldman in passionate and physical roles. He is the exact opposite in this movie. I swear I wouldn’t recognize him he is so different. I remember first watching the movie and thinking “Wow, when did Gary Oldman get so old.” Truth is he didn’t. He’s a really good actor. He is superb. 2.) Benedict Cumberbatch as Peter Guillam Saying Good-bye. Peter Guillam is informed by Smiley that he needs to be careful as he is now being studied as suspicious by the higher ups in the Circus. Thus, with only music playing in the background, we see Guillam going home and telling his lover, his male lover, that they can no longer live together. When the lover leaves Peter sobs. It is so sad and touching. I can’t imagine how tough it was back in the ’70s to be gay. That makes the break-up even harder for me to watch. I always hope in the end that Peter and his honey get back together but we will never know. 3.) Shot Framing. The framing of the shots in this movie are so beautiful. Just beautiful. What you see and don’t see, what is revealed with the camera shots is just wonderful to watch. 4.) Tomas Alfredson the director. Very very very impressed with this movie. The crafting is beautiful. Every part of this movie is perfect. Mr. Alfredson, I bow to you. Well done. 5.) Bryant the Doorman. The character of Bryant the Doorman, play by Arthur Nightingale shows the true mood of the Circus. We first see him standing in hi spot, shuffling, and looking down, frowning. He is watching the old guard of Control and Smiley leaving the Circus for the last time and he is very sad. When we see him next he performing his job by being friendly, greeting people at the door, and in his friendly way making sure they are where they belong. He knows the people who work for the Circus as he greets Peter Guillam by name “Mr. Guillam!” We know by the action of the movie that this is a typical day for the Circus and Bryant is good at his job. Mr. Guillan knows him and they smile at one another while trading pleasantries. At the end, with Smiley in charge and house having been cleaned, Bryant stands and with a radiant smile on his face, bows to Smiley as he enters the Circus. A bow of “Oh well done! !” That is one of my favorite moments in the movie. Well done Mr. Nightingale and your portrayal of Bryant the Doorman. BECHDEL TEST (Website): 1 of 3. Yes there are named females but they do not appear together and are secondary characters. Well this is a movie about a certain set of men in a certain time so I am not too surprised. They were interesting women and that was nice. RACIAL BECHDEL TEST (Website): 0 of 3. Oh my I didn’t see any PoC in this movie. Sigh. Yes it is a movie about the English Secret Service in the early ’70s so seeing a PoC character is indeed rare. It would be fun to see a new version of this story with PoC. DVD/BLU-RAY WORTHY: I do!!! I even bought it on Amazon.com Direct so I can watch it when there is no DVD player around. LION PAW PRINTS: 4 of 5. Yes it is that good. LINKS: Here are some good informational links I have found about the movie and book. I hope you enjoy them. 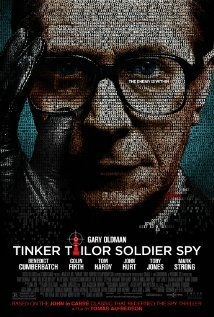 The Fine Art Diner: Amidst the Dead Leave: Tinker, Tailor, Soldier, Spy – This is an artistic analysis of the movie. It focuses on symbolism and the how and why of the movie construction. It is very good. This is Katherine Farmar’s Website: Tinker, Tailor, Soldier, Spy: Novel, TV Series, Film – part 1 & Tinker, Tailor, Soldier, Spy: Novel, TV Series, Film – part 2 – These two pages give a detailed and interesting comparison between the book, TV mini series, and movie. Very enjoyable reading.